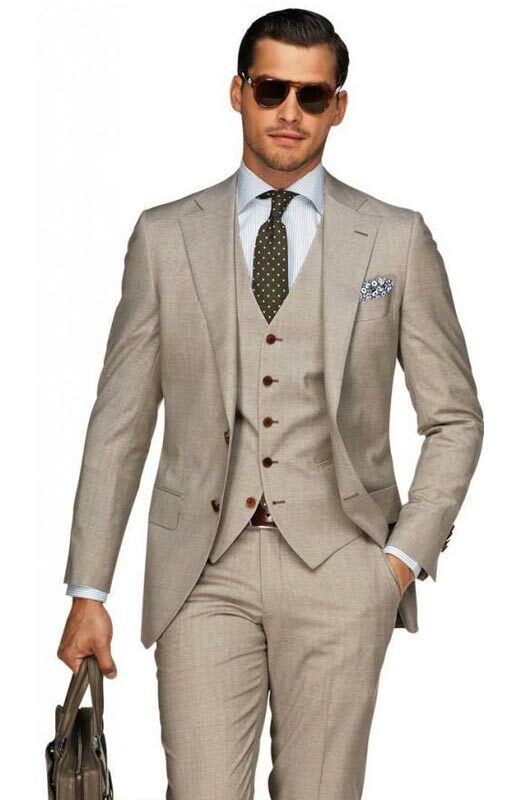 Linen suits for men are very suitable for summer and spring style. They can be alternated in various forms; dressing seasonally can be very challenging especially when it comes to the unbearable heat of the summer. 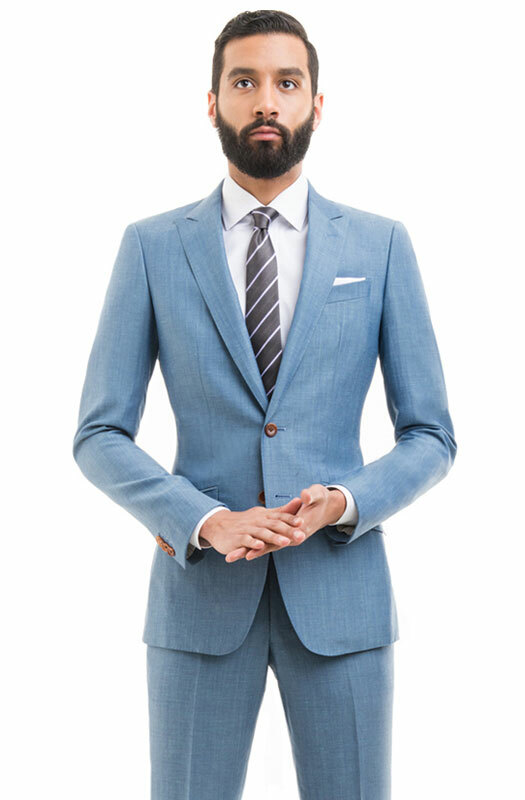 People usually disregard suits to avoid suffering in the heat, material like wool and polyesters which are claimed to be suitable for four seasons make it even worst, so there’s only one option left which is the linen suit. Linen is a textile formed of the fibers of the flax plant. The word Linen is derived from a Latin name of the flax plant called Linum. The garments made up of linen are very cool and refreshing in hot weather. There are Numbers of products are made up of linen like towels, tablecloths, aprons, bags, etc. Linen was discovered thirty thousand years ago by the ancient people who used flax fibers to create fabrics similar to linen. There are lots of great properties of the linen fabric; it is fresh, soft, smooth, lint-free and washable. However, it has no elasticity. Linen fibers have high natural glaze which ranges between different colors like gray-white ivory; it can absorb an adequate amount of water without getting damp, unlike cotton. Linen was considered luxurious and expensive, it was used for mummification by the Egyptians, and for used to make soft cushions and bed sheets for the sovereign people of the palace. But in the 20th-century linen made its impact on menswear, starting with a lounge suit which then became a must wear for men in the warm season. From then the linen colors became a symbol of different social class. The brown and navy colors were worn by labors who worked in the dirt whereas the white and beige color was for the wealthy people who didn’t have to grind a single day. But post world war two linen became a fashion fabric, which became favorite among the men during the summer time. By now, you’re aware that linen is a type of fabric that you should incorporate into your summer outfit. Why wear a linen suit? Linen suits are extremely fashionable, lightweight and durable. You do not need to compromise on your formal outfit in summers if you have a linen suit. 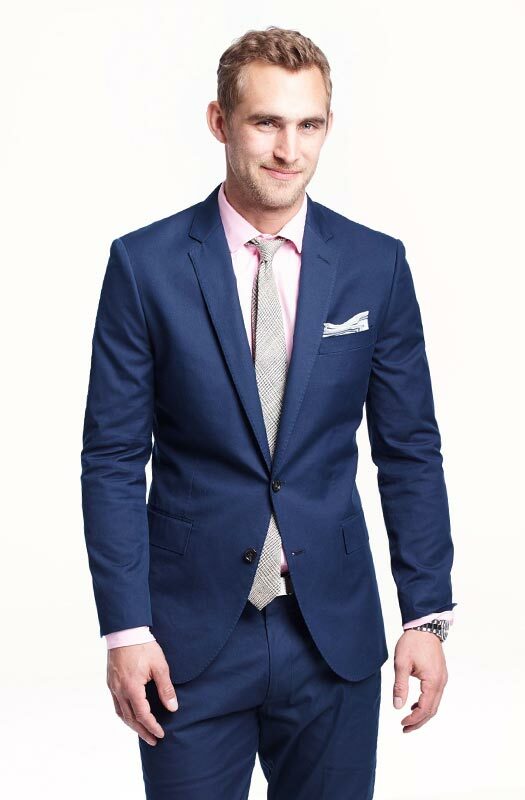 The mens linen suit are very suitable for corporate wear and are also an excellent choice for a casual scenario, whether it is a wedding or a friend’s birthday party you can look effortlessly cool. There are countless styles and variations you can apply to you linen suit. This is the most formal form of the linen suit if you’re invited to a wedding this summer or even if it’s your wedding the three-piece linen suit is possibly the best option you have. A three piece suit can never be so soft, relaxed and comfortable unless it is made up linen fabric; a two button closure jacket combined with the same color trouser and waistcoat are a beautiful combination. A matching tie and a light color shirt make it even better. You can also wear a pocket square matching your shirt to create a contrast with the suit. To achieve an informal look you can skip the waistcoat making it a two piece suite. The two piece linen suit is less formal compared to the three piece suite; it is best for corporate meetings and conference. It can also be used every day as an office wear. 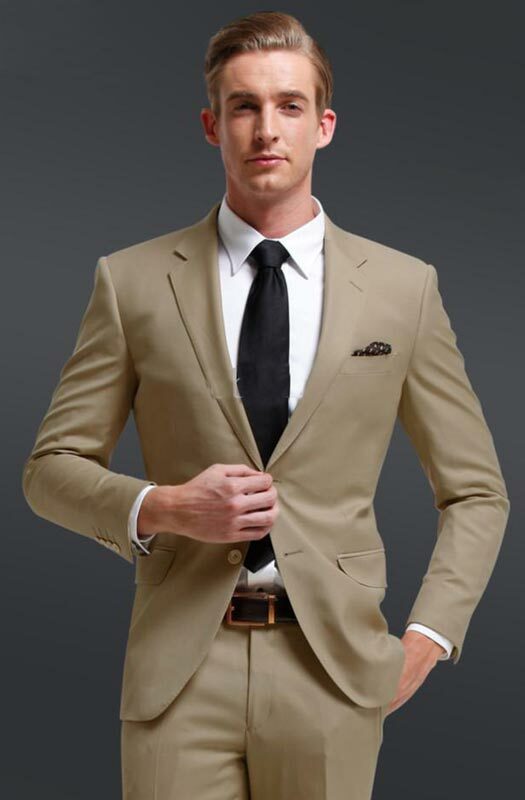 Always remember the golden rule that your shirt should be of a light color creating a contrast with a darker tie. Light blue suits and white are the most appropriate colors for shirts. You can also try a check or striped shirts with different colors but by sticking to basics will make you look more effortlessly cool. To achieve an informal look you can skip the waistcoat making it a two piece suite. The two piece linen suit is less formal compared to the three piece suite; it is best for corporate meetings and conference. It can also be used every day as an office wear. Always remember the golden rule that your shirt should be of a light color creating a contrast with a darker tie. Light blue and white are the most appropriate colors for shirts. You can also try a check or striped shirts with different colors but by sticking to basics will make you look more effortlessly cool. During the 21st century, blue has become the new black; it is versatile for any season or occasion. The navy blue has never been this accessible before. It can sometimes be challenging and annoying to decide what to wear with the blue suit, and then various questions pop up like should I wear a brown or black shoe? And, what about the shirt Should I wear light or dark color? The best answer to this is that a shirt two-three shade lighter than you coat will work fine and both black and brown shoes are acceptable. When talking about dark colors the black color can never be forgotten. The black color is probably the favorite color of almost every human being that exist. It is also highly versatile which mean it goes well with every color so if you have a hard time to match your outfit or if you simply love the black color the black linen suit is the best option for you. Dark colors like Navy blue, dark brown and charcoal look elegant and give a very formal feel while lighter colors like gray, off white and sky blue portray a vintage 1920 style. Navy blue is the classiest and the most versatile color when compared to others, but it doesn’t mean that you can ignore the lighter shades the light colors have their charm which they bring to the table especially if you’ve never owned one before. People tend to go for colors like black and blue, but they don’t know the importance of the grey color. The gray color suit is very handy e.g. if you wear suits daily for work you can’t just wear the black and blue suit. It very importance to bring a change in your outfit. In this case, the gray suit is best if you repeatedly wear the same color outfit you will feel dull, but the grey linen suit will give you a refreshing appearance. 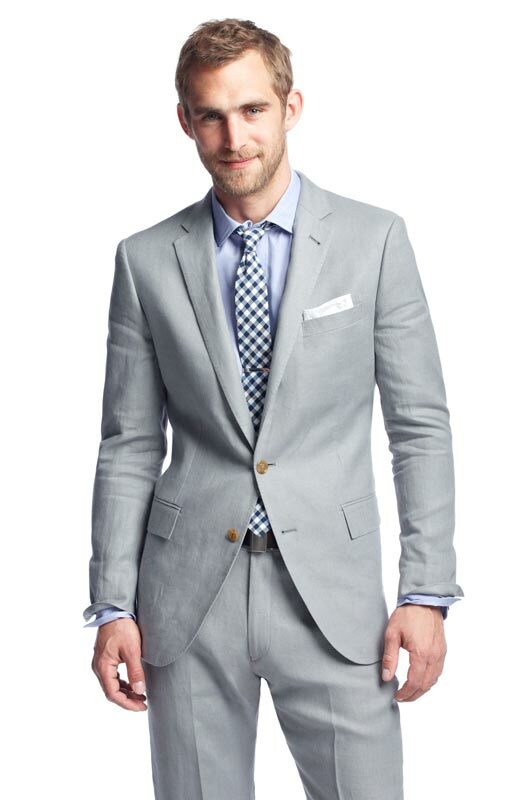 Not only for work you can also wear the gray suit on a special event where people wear the same old colors. If you’re bored of the old plan suite design you can also try different pattern of suits. 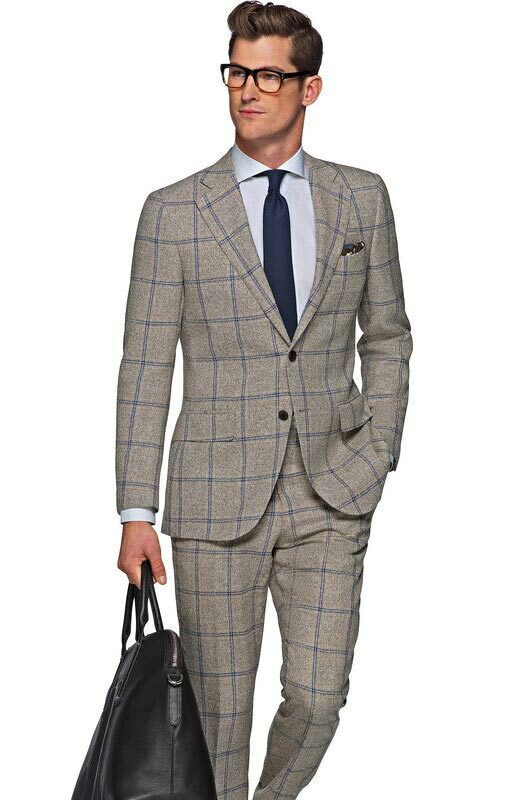 The check suits were famous during the 70s and are now regaining their popularity, why not? They look so stylish and sophisticated. The checkered suits are often difficult to match with your shirt and tie, but if done correctly, it can make you look excellent. They can usually be worn with plain shirts. A checkered suit with a plain shirt combination looks so attractive and different it can make you stand out from the crown. But it should not be worn with printed shirt or tie which might get you look the opposite. 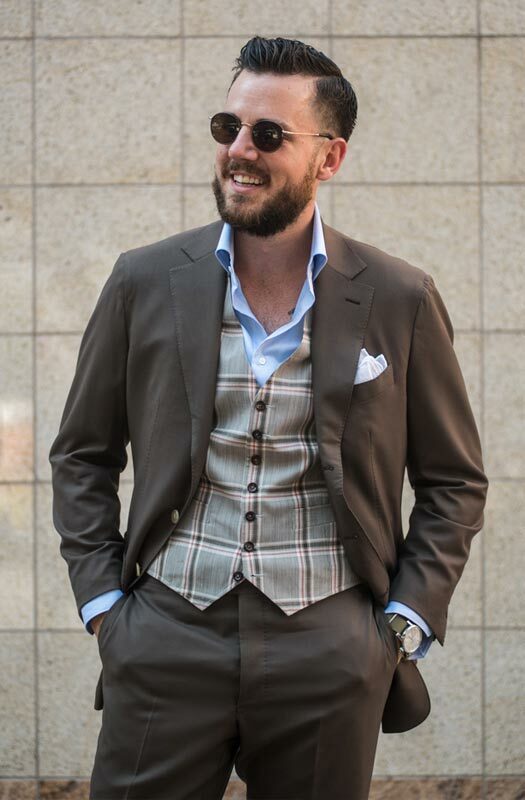 It is not necessary that the whole suit should be of a checkered pattern a patterned waistcoat paired with a plain coat and trouser can also look equally stylish which is yet another variation in the linen suit. In this case keeping it simple is vital adding a fancy tie and ruins your entire outfit wear a tie or not is a matter of choice but if you do a plain tie should be your priority. 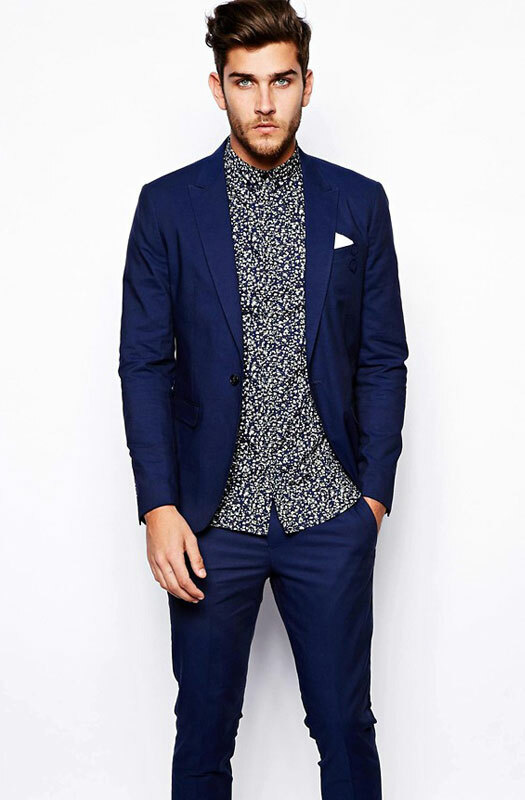 The blue linen suit or waistcoats are excellent to wear formally, but if you want more casual appearance, you can add a fancy looking linen shirt. The gray and blue combinations look epic along with the brown shoes. With this kind of outfit, you’re going to come under the spotlight. Shorts sleeve linen shirt hang a bit loose compared to their cotton counterparts, so you should but one size smaller. There are a plenty of brands that sell these short sleeve shirts at various prices and designs. The long sleeve linen shirts are of two varieties, dressy and casual. You will quickly find the rugged and outdoor designs but searching for the sleek, formal design can be a bit arduous task. The long sleeve shirt is best if you’re wearing a coat. The belted linen pants look baggy, and they are found in lighter, gaudier colors. The belted pants are old fashioned. Drawstring linen pants seem like the regular pant you wear. These pants have a quasi-casual look and are very stylish since the 2000s; they are classier and modern compared to the belted pant and it gives a. It is better to wear a drawstring pant if you’re dressed in a suit. 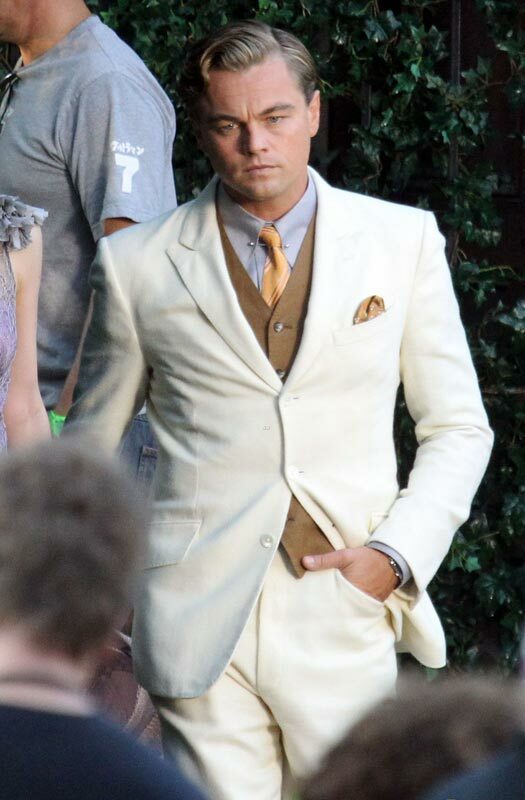 People usually stay away from colors like white when it comes to the suit, but Leonardo Dicaprio had changed the trend when he was seen in the movie The “Great Gatsby” wearing a mens white linen outfit. The mens white suit was very well matched with the dark brown vest and an orange tie with a pocket square of the same color. David Beckham was dressed up in a dark linen suit for an event, the suit was entirely black along with the t-shirt as well, But he created a contrast with his white shoes; the addition of the t-shirt and the sneakers gave his attire a casual and stylish look he is indeed a trendsetter. The linen suits are not only restricted to men, but women can also wear the linen suits and look very attractive. There are numerous colors and designs of the linen suit womens as well. A lot of fancy accessories are not required to look good; only a plain white linen suit is good enough to make you look exceptionally beautiful and keep you cool simultaneously. Whether you’re going to work or shopping, linen jackets are very compatible. Unlike men, women can wear any color they want, and it will still look good. Lively colors like pink, yellow, orange and green look great. Suits like this can be worn daily; it will keep you cool if you’re on a move during a warm sunny day. Red might be too hot and bright, but you can calm it with a soft white color the combination of red and white is totally out of the world. With the bright red color, it is not necessary to add accessories the color is so grand that it speaks for itself. 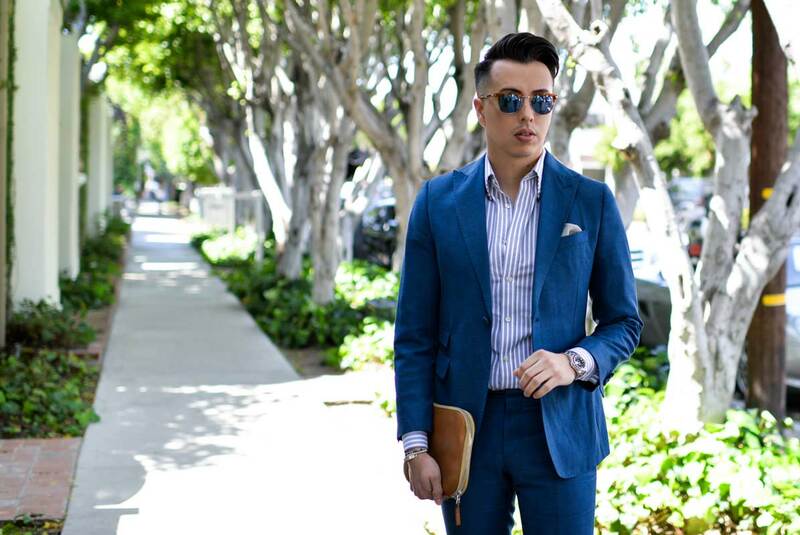 Whether you wear the linen suit, shirt or pant; it is inherently made for the warm weather. Most fashion experts contend that it is the best fabric between May and September. The linen fabric since ages has been a mark of royalty that same material has now transformed into a modern outfit which is a must wear for summers, the characteristics of linen like its comfort and elegant looks gives it an edge over other materials, i.e., wool and cotton which are unbearable in a warm season. The Linen suit has unlimited qualities like colors, patterns, design and styles. The suite is not limited to a particular gender, it is also not restricted to a specific kind of occasion, you can wear it daily or on a specific occasion it is totally up to you. Therefore, if you have a linen suit, you can never go out of fashion.